Dedicated to preserving and enhancing urban natural areas for ourselves and future generations. “We call it Boundary Waters South,” Katie Pata, operations coordinator for the Dakota County parks. Natural resource volunteers are vital to the health of our urban regional parklands and watersheds. Support our work to enhance and preserve natural resources in Lebanon Hills and other Regional Parks across the Twin Cities. If approved by the full legislature, $40 million will flow into the metro regional parks mostly to build infrastructure, in contrast to the public’s top priority to take care of natural resources. HF653/SF2444 bill includes more than $40 million in Parks and Trails Legacy Fund appropriations for the Metropolitan Regional Parks System. The bill was heard in the House Legacy Finance Division hearing on 4/3. The Senate version was heard on Wed., 3/27. Public testifiers in both committees were cut short; both bills moved through respective committees. Included in the $40 million appropriation is $1.2 million for undefined projects within Spring Lake Park Reserve, construction projects for maintenance sheds, administrative buildings, wave pool reconstruction, and significant additional capital development projects within this nature-based parks system. Notably lacking from the list are natural resource restoration projects. Wilderness in the City has consistently expressed concerns regarding conflicts in the project approval process and spending for construction which has negatively impacted the natural resource base of these parks. We are advocating for changes to the project approval process, and a rebalance of spending to better meet citizens expectations for Legacy investments. What will we leave the next generation: Nature…or more stuff to take care of? The Metropolitan Regional Parks System includes habitats for endangered species, fens, prairies, wetlands, woodlands and water resources. These valuable resources are stressed and degraded throughout the system. Contrary to what voters intended when they supported the 2008 Legacy Amendment, the majority of spending throughout the Metropolitan Regional Parks System has focused on the built environment to the detriment of our valuable Nature-based Parks System. If this trend continues, the Legacy we will leave behind is contrary to what voters and taxpayers intended. Instead, we believe it is our responsibility to leave these place better than we found them. If you agree, then learn more about A Legacy of Nature: A campaign to ensure that healthy ecosystems are restored and preserved throughout our regional parks system, with year-around nature-based opportunities to inspire the next generation of environmental stewards. Wilderness in the City is dedicated to preserving and enhancing urban natural areas for future generations of people and wildlife. We are a 501(c)3 nonprofit organization, fully supported by donations from our members. All donations are 100% tax-deductible. Help support our work by becoming a member today! Thank you for your support. 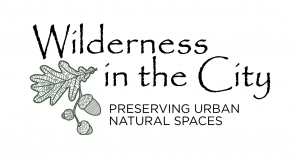 We are Wilderness in the City – dedicated to preserving and enhancing urban natural areas for future generations. Wilderness in the City’s informative newsletters are published quarterly and include timely information on issues relative to Lebanon Hills and the regional parks system. There are many ways to volunteer Wilderness in the City. Depending on your interest, you can participate in a natural resources work night, volunteer to work at a community event, or attend hearings and meet with Legislators to discuss A Legacy of Nature. Learn more about Lebanon Hills Regional Park and the controversial 2015 Master Plan, and what we are doing to help preserve the wilderness character of this beloved park, which is its greatest character. Find information relating to Dakota County Parks Department, the implementing agent for Lebanon Hills, including links and information related to natural resources, parks, and trails. Contact us to learn more about any issues we are working on, or if you’d like to get involved.